Clay Pot Cooking and Yoga. They are ancient. They are earthy. They are delightful. Both require patience and hydration. The pots themselves are a lot like yogis. They come in all shapes and sizes and each is unique. 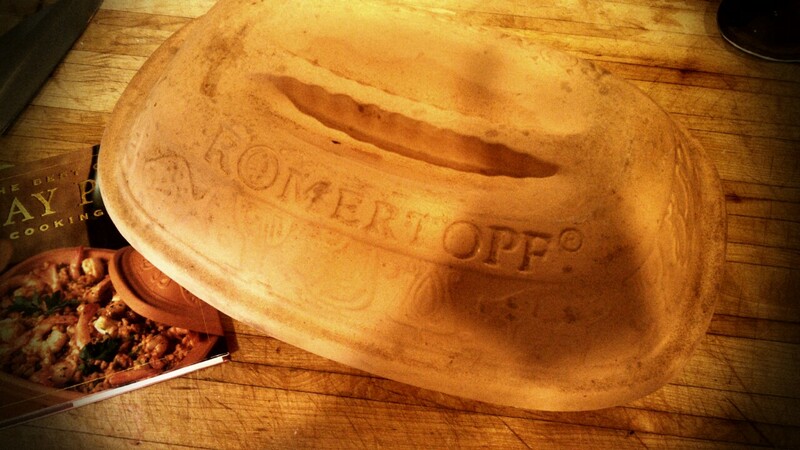 I stumbled onto cooking with a clay pot when I came into the possession of a Romertofp Pot along with a little recipe book. Having never seen one before I was intimidated, so I let it sit in its box, tucked away, until I uncovered it during a move. At the time I discovered the pot, I was experiencing my own little cooking renaissance. Until then, I had never considered myself much of a cook. Anytime spent in the kitchen was for organizing salads or reheating someone else’s dish. Throughout college and the years following, I depended on other’s culinary skills and the miracle of take out. On New Year’s Day in 2005 I checked my office voicemail from home to learn that the company I was working for had declared bankruptcy and the entire workforce was laid off. Suddenly, I had a lot of time on my hands. Sitting on my couch, avoiding my job search, I thumbed through a macrobiotic cookbook given to me by my sister. It was my jumping off point. Before I knew it, cooking became a daily obsession. I loved hunting down hard to find ingredients, bringing them home and following the happy formula of the recipe. Nothing gave me pause. I cooked with seaweed, umi plum vinegar, kuzu root and miso paste. I got bolder and started examining other cookbooks. Soon I was steaming my own bagels, roasting beets and whipping up chicken tamale casseroles. By Mother’s Day I had the culinary confidence to cook a full meal for 10 people. It was around this time I found the clay pot, never unboxed, sitting in a lonely corner of my basement. This time, I saw it with new eyes. Finding the clay pot, earthen and humble, all but forgotten, reminded me of getting my first bike. I had never ridden before, but I was dying to take it for a spin. What does this have to do with taking our practice off our mat? First, the word practice. I had weeks of cooking practice under my belt. My practice gave me confidence to try something new, something that had previously been indecipherable and intimidating. Just like yoga. As we build our practice on our mat, the impossible becomes possible. Second, one of my favorite yoga instructors has a great way of articulating an instruction. In class we will be holding a particularly long pose and she will invite us to take the pose to the next level by saying “because you can.” For example, we will be in a side angle bind, holding through a long count of 5 and she will say “Let your heart shine to the ceiling, because you can.” Speaking those three little words, she is empowering us to take advantage of all our abilities. You’ve got muscles, strength, flexibility and will. Use it. Because you can. Looking back, rediscovering my clay pot was a “because you can“ moment. I didn’t worry about my lack of experience or the baffling simplicity of the pot itself. I had the pot, I had an oven and I could cook. Taking your practice off your mat isn’t always a conscious thing. It is something you just do – because you can. Click here to check out an unbelievably delicious Clay Pot Indonesian Beggar’s Chicken recipe. Categories: Cooking, Yoga | Tags: balance, clay pot chicken, clay pot cooking, cooking, life, love, pose, practice, romertofp, side angle bind, yoga | Permalink.